Our first destination in Thailand was Chiang Mai. 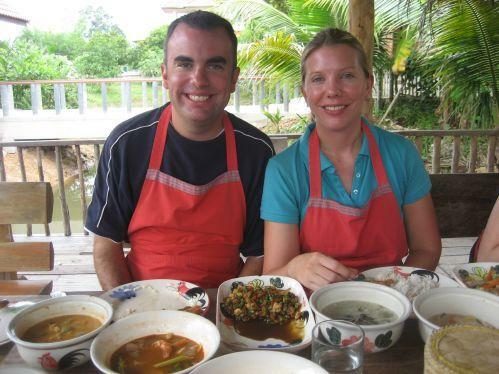 We spent a few days there taking a Thai cookery course and going trekking. We really enjoyed the cookery course which was held at an organic farm. We learnt lots of new recipes and techniques and ate all day! We were quite lucky with the weather on our trek (we only got caught in a torrential downpour on one of the days!). We enjoyed staying in the jungle in bamboo huts and going rafting. We then flew to Bangkok which was a much bigger city than we expected! We visited the Grand Palace amongst other temples and saw the huge (46m!) reclining buddha at Wat Pho. We took a ferry trip on the Chao Phraya river, visited friends in the city and Craig got some suits tailored. We left the madness of the city behind this morning to escape to the beaches of Koh Samui and have spent our first day relaxing by the pool and walking on the beach!